Asikpasa whose real name Ali, was born in Arapkir in 1272 and died in Kirsehir in 1333. Asikpasa who used real Turkish in his works learned his religion and mysticism knowledge from Seyh Suleyman Turkmani. Asikpasa built a zaviye in Kirsehir. Asikpasa's work ''Garipname'' which has twelve thousand couplet has an importance of being written in Turkish. Gripname is the most famous work of Asikpasa. 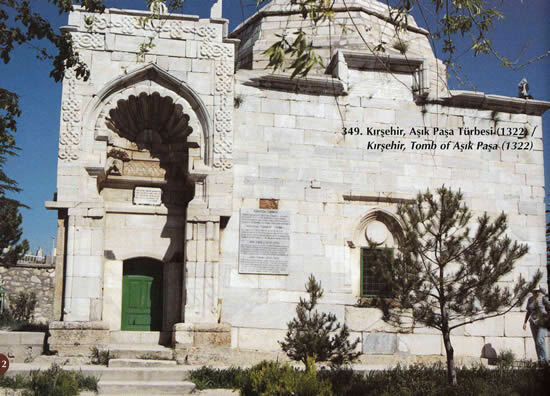 Asikpasa Tomb is in the big cemetery that is located in Asikpasa neighborhood on a hill on the way Ankara-Kayseri. The construction was built as two parts. The part on the north is rectangular planned on the east and west direction; the part on the south has a square plan. The rectangular part designed as the entrance part. Square part is the tomb where there is Asikpasa's coffin. The arch niche of the entrance liwan was constructed as ten slices oyster shell. Since the building's dome resembles Kirghiz tent, it is thought its architect might have been a Turk who came from Horasan. There is an inscription on the west front axis of the tomb where the birth and death dates of Asikpasa were written. Asikpasa reacted towards who admire Arabian and Persian culture. He has well-known poems for people who indulged to foreign culture. Even the poem with four lines, which was written in his tomb, is one of the most known among those poems.